When you're serious about drumming, you need a kit to match your ambition. 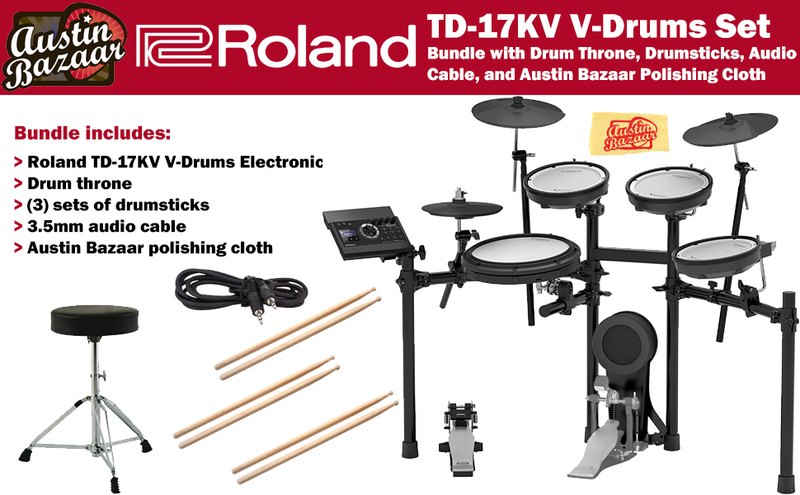 The V-Drums TD-17 series lets your technique shine through, backed up with training tools to push you further. 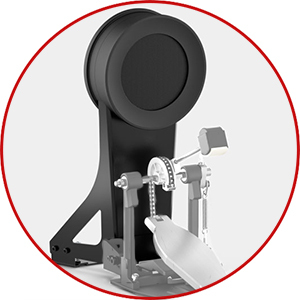 Combining a TD-50-class sound engine with newly developed pads results in an affordable electronic drum kit that's authentically close to playing acoustic drums -- accurately mirroring the physical movement, stick coordination and hand/foot control that every drummer needs. Meanwhile, an array of built-in coaching functions will track your technique, measure your progress and increase your motivation. Becoming a better drummer is still hard work, but the TD-17 can help you get there. This Austin Bazaar bundle includes essential accessories to get you started. Be the king of this drumset with the included drum throne. Three pairs of drumsticks make sure you will have extras. 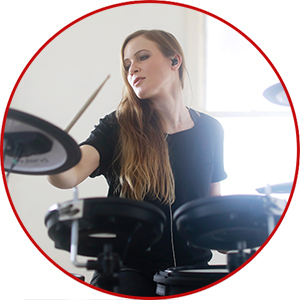 You can also use the included audio cable to connect your phone to your drums and play along to your favorite tracks! 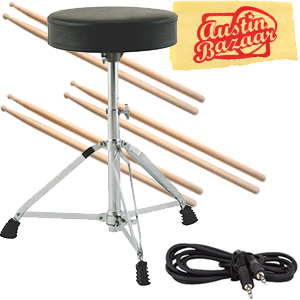 When your drumming session is over, wipe down your set with an Austin Bazaar polishing cloth. 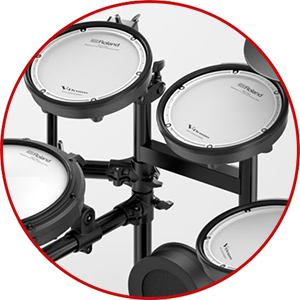 The TD-17 module includes 50 premium quality drumkits for a range of professional musical scenarios. The warm, wooden vibes of 'Acoustic'. The small-but-tight 'Compact' which captures the sound of smaller stages. The wide-open expanse of 'Arena Stage'. The clarity of "Studio" which is perfect for recording. The richness of "Fat Rock" or the intensity of "Speed Metal"...whatever music gets you going, the TD-17 will help you get there. 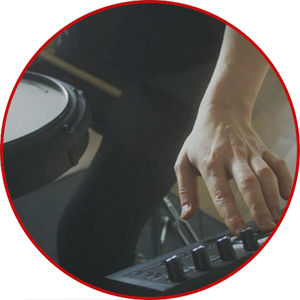 Today's pro drummers craft their signature drum sounds by layering many sound elements; a snare sound is made by layering different snare sounds, each with their respective attack elements, ambience and so on. 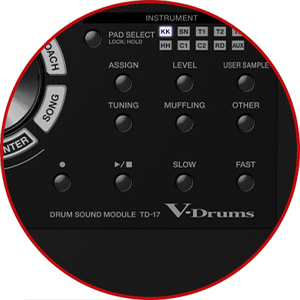 The TD-17 also lets you create your signature drum kit, by using onboard pitch control, EQ, effects and more. Some electronic kits use much smaller pads than you'd typically find on an acoustic kit - but because the drumstick has to hit the center of each drum, these smaller pads can actually feel further away from you. This is especially true if you've moved from playing a 14-inch acoustic snare to an 8-inch rubber pad. The 12-inch dual-mesh PDX-12 snare is tension-adjustable for authentic and satisfying rebound, while the height of the snare hoop is much closer to that of an acoustic snare so you can hit an open rim shot with a natural stick angle. If you're serious about drumming, the TD-17 lets your technique shine through without asking you to compromise. A nice solid kick drum usually comes with a nice loud noise. Sometimes that's exactly what you want, but your family or neighbors may not feel the same way. The KD-10 kick pad absorbs much of the noise thanks to its rubber cover combined with a dedicated cushion, but retains that satisfying kick drum 'thud' when a beater buries into a bass drum head, so it's ideal for playing at home where loud noise may cause problems. It's compatible with all standard kick pedals, single or double kick.